SUN RA-SEVEN OF THE BEST REISSUES OF 2017. Labels: Grey Scale, Cosmic Myth Records, Strut and ORG Music. One of the most prolific artist of the twentieth century was the inimitable Sun Ra, who released around 125 albums during a career that spanned six decades. Over the last few years, dozens of these albums have been reissued by various reissue labels in Britain, Europe and America. For fans of Sun Ra this is the perfect opportunity to discover albums that have never been reissued before. Many of these albums were originally released in the fifties, sixties or seventies, and nowadays, original copies are either impossible to find, or beyond the budget of most Sun Ra fans. The reissue of these albums is a welcome opportunity to add these albums to their collection. However, many newcomers to Sun Ra are confused by the dozens of albums that have been released over the last few years. While many of the albums are reissues of some 125 albums that Sun Ra released, some record companies seem to be repacking existing or unreleased music to make new albums. This isn’t just confusing newcomers to Sun Ra, but many longterm fans and even some people within the music industry. It takes some research to separate reissues of original Sun Ra albums from those that contain repackaged material. While some are of interest to fans of Sun Ra, others are of dubious quality. There lies the problem. If a newcomer to Sun Ra chooses the wrong album, it could put them off his music for life. That would be a great shame as Sun Ra was one of jazz’s pioneer and innovators who released many albums of groundbreaking music during his long and illustrious career. Many of Sun Ra albums were reissued during 2017 on vinyl and CD, including the selection in this article. They’ll appeal to both newcomers to Sun Ra and those who followed the great man’s career over six decades. Before dawning the moniker Sun Ra, Herman Poole Blount was born on the ‘22nd’ of May 1914, in Birmingham, Alabama. Very little is known about Herman Poole Blount’s early life. So much so, that for many years, nobody knew what age he was. What we do know, is that growing up, Herman Poole Blount immersed himself in music. He learnt to play the piano at an early age and soon, was a talented pianist. By the age of eleven, Herman Poole Blount was to able read and write music. However, it wasn’t just playing music that Herman Poole Blount enjoyed. When musicians swung through Birmingham, Herman Poole Blount was there to see everyone from Duke Ellington to Fats Waller play. Seeing the great and good of music play live inspired Herman Poole Blount to become a professional musician. By his mid teens, Herman Poole Blount was a high school student, but even by then, music was his first love. His music teacher John T. “Fess” Whatley realised this, and helped Herman Poole Blount’s nascent musical career. John T. “Fess” Whatley was a strict disciplinarian, and this rubbed off on Herman Poole Blount. Later, he would acquire a reputation as a relentless taskmaster when he formed his Arkestra. He was determined that the musicians in his Arkestra to reach his high and exacting standards and fulfil the potential that he saw in them. At rehearsals, musicians were pushed to their limits, but this paid off when they took to the stage. 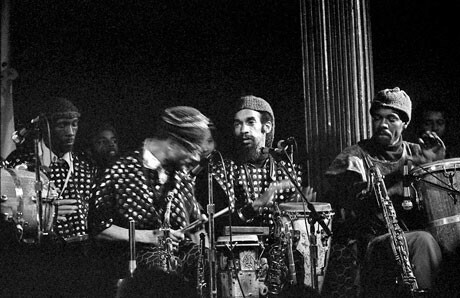 Led by Sun Ra, the Arkestra in full flow were peerless. However, that was way in the future. Before that, Herman Poole Blount’s career began to take shape. In his spare time, Herman Poole Blount was playing semi-professionally in various jazz and R&B groups, and other times, he worked as a solo artist. Before long, Herman was a popular draw. This was helped by his ability to memorize popular songs and play them on demand. Strangely, away from music, the young Herman Poole Blount was very different. He’s remembered as studious, kindly and something of a loner. Herman Poole Blount was also a deeply religious young man despite not being a member of a particular church. One organisation that Herman Poole Blount joined was the Black Masonic Lodge. This allowed him access to one of the largest collection of books in Birmingham. For a studious young man like Herman Poole Blount, this allowed him to broaden his knowledge of various subjects. Whether this included the poetry and Egyptology that would later influence his musical career. In 1934, twenty-year-old Herman Poole Blount was asked to join a band that was led by Ethel Harper. She was no stranger to Herman Poole Blount, and just a few years earlier, had been his high school biology teacher. Just a few years later, and he was accepting Ethel Harper’s invitation to join her band. Before he could head out on tour with Ethel Harper’s band, Herman Poole Blount joined the local Musicians’s Union. After that, he embarked on a tour of the Southeast and Midwest. This was the start of Herman Poole Blount’s life as a professional musician. However, when Ethel Harper left her band to join The Ginger Snaps, Herman Poole Blount took over the band. With Ethel Harper gone, the band was renamed The Sonny Blount Orchestra, and it headed out on the road and toured for several months. Sadly, The Sonny Blount Orchestra wasn’t making money, and eventually, the band split up. However, other musicians and music lovers were impressed by The Sonny Blount Orchestra. This resulted in Herman Poole Blount being always in demand as a session musician. He was highly regarded within the Birmingham musical community, so much so, that he was awarded a music scholarship to Alabama Agricultural and Mechanical University in 1937. Sadly, he dropped out after a year when his life changed forever. In 1937, Herman Poole Blount experienced what was a life-changing experience. It’s a story he told many times throughout his life. He describes a bright light appearing around him and his body changing. “I could see through myself. And I went up … I wasn’t in human form … I landed on a planet that I identified as Saturn. They teleported me. I was down on a stage with them. They wanted to talk with me. They had one little antenna on each ear. A little antenna over each eye. They talked to me. They told me to stop attending college because there was going to be great trouble in schools … the world was going into complete chaos … I would speak through music, and the world would listen. That’s what they told me.” For a deeply religious young man, this was disturbing and exciting. It certainly inspired the young Herman Poole Blount. After his: “trip to Saturn,” Herman Poole Blount decided to devote himself to music. So much so, that he hardly found time to sleep. Day in, day out, Herman Poole Blount spent his time practising and composing new songs in his first floor home which he had transformed into a musical workshop. That was where also where he rehearsed with the musicians in his band. Away from music, Herman Poole Blount took to discussing religious matters. Mostly, though, music dominated his life. It was no surprise to when Herman Poole Blount announced that he had decided to form a new band. However, his new band was essentially a new lineup of The Sonny Blount Orchestra. It showcased the new Herman Poole Blount, who was a dedicated bandleader, and like his mentor John T. “Fess” Whatley, a strict disciplinarian. Herman Poole Blount was determined his band would be the best in Birmingham. This proved to be the case as seamlessly, The Sonny Blount Orchestra were able to change direction, as they played an eclectic selection of music. Before long, The Sonny Blount Orchestra were one of most in-demand bands in Birmingham, and things were looking good for Herman. Then in 1942, The Sonny Blount Orchestra were no more when Herman was drafted. On receiving his draft papers, Herman Poole Blount declared himself a conscientious objector. He cited not just religious objections to war and killing, but that he had to financially support his great-aunt Ida. Then there was the chronic hernia that blighted Herman Poole Blount’s life. Despite his objections the draft board rejected his appeal, and things got worse for Herman Poole Blount. Herman Poole Blount’s family was embarrassed by his refusal to fight, and some turned their back on him. Eventually, though, Herman Poole Blount was offered the opportunity to do Civilian Public Service. However, he failed to appear at the camp in Pennsylvania on the December ‘8th’ 1942. This resulted in Herman Poole Blount being arrested, and when he was brought before the court, Herman Poole Blount debated points of law and the meaning of excerpts from the Bible. When this didn’t convince the judge Herman Poole Blount said he would use a military weapon to kill the first high-ranking military officer possible. This resulted in Herman Poole Blount being jailed. For Herman, this led to one of the most disturbing periods in his life. Herman Poole Blount’s experience in military prison were so terrifying and disturbing that he felt he no option but to write to the US Marshals Service in January 1943. By then, Herman felt he was on the verge of a nervous breakdown. He was suffering from stress and feeling suicidal. There was also the constant fear that he would be attacked by others within the military prison. Fortunately, the US Marshals Service looked favourably on his letter. By February 1943, Herman Poole Blount was allowed out during the day to work in the forests around Pennsylvania. At nights, he was able to play the piano. A month later, Herman Poole Blount was reclassified and released from military prison. This brought to an end what had been a harrowing period of his life. Having left prison, Herman formed a new band. They played around the Birmingham area for the next two years. Then in 1945, when his Aunt Ida died, Herman Poole Blount left Birmingham, and headed to the Windy City of Chicago. After moving to Chicago, Herman Poole Blount quickly found work. He worked with Wynonie Harris and played on his two 1946 singles, Dig This Boogie and My Baby’s Barrelhouse. After that, Herman Poole Blount worked with Lil Green in some of Chicago’s strip clubs. Then in August 1946, Herman Poole Blount started working with Fletcher Henderson. However, by then, Fletcher’s fortunes were fading. By then, Fletcher Henderson’s band was full of mediocre musicians. The main man, Fletcher Henderson, was often missing, as he was still recovering after a car accident. What Fletcher Henderson needed was someone to transform his band’s failing fortunes. This was where Herman Poole Blount came in. His role was arranger and pianist, but realising the band needed to change direction, he decided to infuse Fletcher Henderson’s trademark sound with bebop. However, the band were resistant to change and in 1948, Herman Poole Blount left Fletcher Henderson’s employ. Following his departure from Fletcher Henderson’s band, Herman Poole Blount formed a trio with saxophonist Coleman Hawkins and violinist Stuff Smith. Alas, the trio was somewhat short-lived and didn’t release any recordings. Not long after this, Herman Poole Blount would make his final appearance as a sideman on violinist’s Billy Bang’s Tribute to Stuff Smith. After this, Herman Poole Blount became Sun Ra. By then, Chicago was changing, and was home to a number of African-American political activists. Soon, a number of fringe movements sprung up who were seeking political and religious change. When Herman Poole Blount became involved, he was already immersing himself in history, especially, Egyptology. He was fascinated with the Chicago’s many ancient Egyptian-styled buildings and monuments. This resulted in Herman Poole Blount discovering George G.M. James’ The Stolen Legacy. Discovering this book was a life-changing experience. In The Stolen Legacy, George G.M. James argues that classical Greek philosophy actually has its roots in Ancient Egypt. This resulted in Herman Poole Blount concluding that the history and accomplishments of Africans had been deliberately denied and suppressed by various European cultures. It was as if his eyes had been opened. For Herman Poole Blount, this was just the start of a number of changes in his life. As 1952 dawned, Herman Poole Blount had formed a new band, The Space Trio. It featured saxophonist Pat Patrick and Tommy Hunter. At the time, they were two of the most talented musicians Herman knew. This allowed him to write even more compacted and complex songs. However, by October 1952, he wasn’t writing these songs as Herman Poole Blount. No. Sun Ra was born in October 1952. Just like Malcolm X and Muhammad Ali, adopting the name Sun Ra was perceived by some as Herman choosing to dispense with his slave name. This some felt, was a kind of rebirth for Sun Ra. It certainly was a musical rebirth. After Pat Patrick got married, he moved to Florida, which left The Space Trio with a vacancy for a saxophonist. Tenor saxophonist, John Gilmore was hired and filled the void. He would become an important part of Sun Ra’s band. So would the next new recruit alto saxophonist Marshall Allen. They were then joined by saxophonist James Spaulding, trombonist Julian Priester and briefly, tenor saxophonist Von Freeman. Another newcomer was Alton Abraham, who would become Sun Ra’s manager. He made up for Sun Ra’s shortcomings when it came to business matters. While he was a hugely talented bandleader, who demanded the highest standards, Sun Ra, like many other musicians, was no businessman. With Alton Abraham onboard, Sun Ra could concentrate on music while his new manager took care of business. This included setting up El Saturn Records, an independent record label, which would release many of Sun Ra’s records. However, El Saturn Records didn’t released Sun Ra and His Arkestra’s debut album, Jazz By Sun Ra. Jazz By Sun Ra was released in 1956, on the short-lived Transition Records. However, Sun Ra and His Arkestra’s sophomore album Super Sonic Jazz was released in March 1956, on El Saturn Records. Sound Of Joy was released on Delmark in November 1956. For the next few years, El Saturn Records released most of Sun Ra and His Arkestra’s albums. By his death in 1993, Sun Ra had released over 125 albums. The man they once called Mr. Mystery was by then, one of the most prolific recording artists. 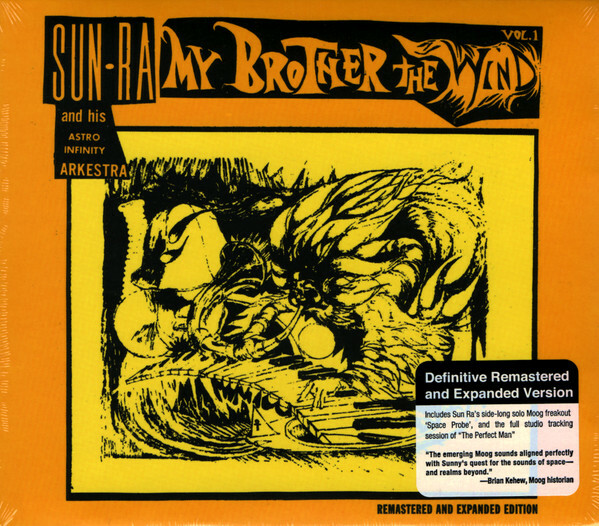 Sun R was also regarded as one of the pioneers of free jazz. Since then, Sun Ra’s popularity has grown, and every year, his music is discovered by a wider audience. That was the case during 2017, when record labels in Britain, Europe and America released countless reissues of albums from the veritable feast that is Sun Ra’s back-catalogue. For newcomers to Sun Ra’s music here’s a few of the albums to investigate and enjoy. Fate In A Pleasant Mood. Sun Ra And His Myth Science Arkestra recorded the seven tracks that became Fate In A Pleasant Mood during a marathon recording session that took place in mid-1960 in Chicago. Tracks from this session featured on five albums, including Fate In A Pleasant Mood which was recently reissued by Grey Scale. 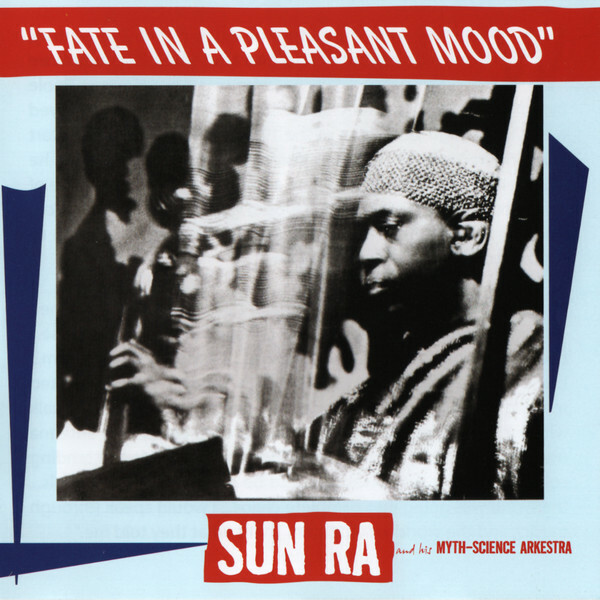 Five years after Sun Ra And His Myth Science Arkestra recorded the music on Fate In A Pleasant Mood, it was eventually released in 1965 on Saturn Research, which was an imprint of Sun Ra’s El Saturn label. Unlike previous albums, the tracks were shorter, with Fate In A Pleasant Mood lasting just twenty-five minutes. Despite its relative brevity and Fate In A Pleasant Mood being a recording from five years earlier in 1960, the music still sounded ahead of its time and innovative. Sun Ra And His Myth Science Arkestra were among the finest purveyors of free jazz, and tracks like The Others In Their World, Space Mates and Lights On A Satellite were proof of this. They’re part of Fate In A Pleasant Mood, which is an album that somehow, not only manages to be accessible and innovative, but has stood the test of time. 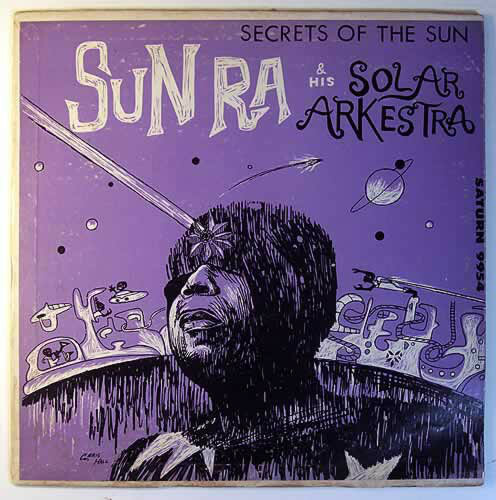 Secrets Of The Sun originally released by Sun Ra and His Solar Arkestra 1965, on El Saturn Records which was founded in 1957 by Sun Ra and his manager Alton Abraham. Eight years later, in 1965, and Sun Ra was in the midst of what’s now referred to as Sun Ra’s “Solar” period. One of the most accessible albums that Sun Ra and His Solar Arkestra released during their “Solar” period was Secrets Of The Sun, which was released during 2017 by Grey Scale. When Secrets Of The Sun was recorded, Sun Ra had already moved away from the advanced swing of the early recordings that took place in Chicago. However, Sun Ra was still to move towards the increasingly experimental free form music recorded during his stay in New York. Essentially, Sun Ra was in a transitionary when Secrets Of The Sun was recorded. Despite that, Secrets Of The Sun featured two future Sun Ra standards, Friendly Galaxy and Love in Outer Space. Sadly, one of the best tracks recorded during the Secrets Of The Sun sessions, Flight To Mars, didn’t make it onto an album were Sun Ra and His Solar Arkestra fused free jazz, space-age jazz and post bop. Given the limitations of vinyl, there was no room for Flight To Mars, a seventeen minute epic, which features some outstanding solos. Flight To Mars is included Grey Scale’s reissue of Secrets Of The Sun, which is one of the most accessible albums of Sun Ra and His Solar Arkestra “solar” period. When Angels Speak Of Love. A year after releasing Secrets Of The Sun, Sun Ra And His Myth Science Arkestra released When Angels Speak Of Love in 1966. It was also reissued by Grey Scale and showed a very different side of Sun Ra. 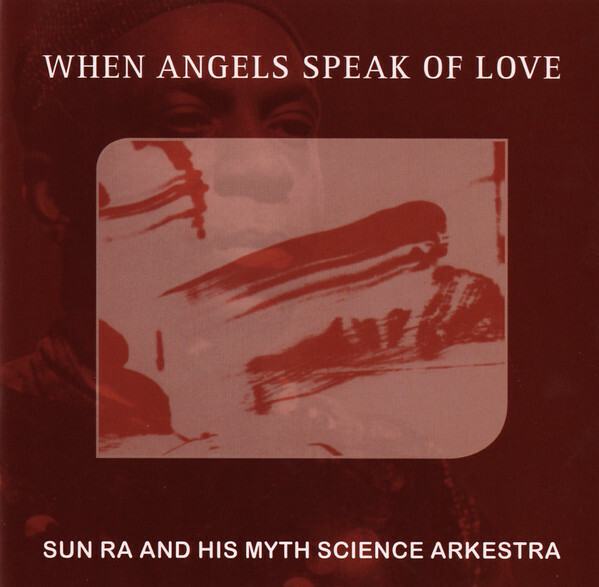 When Angels Speak Of Love was released on Sun Ra’s El Saturn label, and was only available by mail order or at concerts. Those that bought When Angels Speak Of Love discovered what some critics at the time called “a bizarre record” However, these critics failed to discover what was a truly groundbreaking album where Sun Ra And His Myth Science Arkestra continued to move free jazz in a new direction. To do this, they used increasingly shrill notes, layered rhythms and effects including echo reverb. During Next Stop Mars, which is the centrepiece and highlight of the album, a space chant sets the scene for Marshall Allen and John Gilmore braying, growling and shrill horns as they push them to the limits. Meanwhile, Sun Ra’s keyboards underpin the arrangement, during Next Stop Mars, which was part of genre-melting album of groundbreaking album. It finds Sun Ra And His Myth Science Arkestra fusing avant-garde and free jazz with their unique brand of space age jazz on When Angels Speak Of Love. For fans of Sun Ra’s music this was album where not for the first time, he was way ahead of the curve musically. By 1970, Sun Ra had drilled his Arkestra into one of the top free jazz bands. Proof of this was My Brother The Wind Vol. 1 which was recorded by Sun Ra and His Astro Infinity Arkestra at Gershan Kingsley’s Studio, New York, on the ‘12th’ of November 1969. As a new decade dawned, My Brother The Wind Vol. 1 was released by Sun Ra’s Saturn Research in 1970. When My Brother The Wind Vol. 1 was released in 1970, it was one of most free performances by Sun Ra and His Astro Infinity Arkestra as they showcase their considerable skills. That was the case on the title-track where Sun Ra plays two Mini Moogs which unleash a myriad of otherworldly sounds and is accompanied by drummer John Gilmore. However, it sounds as if Sun Ra and His Astro Infinity Arkestra drop acid during the lysergic freakout that is Intergalaxtic II. Closing the album was The Code Of Interdependence where Sun Ra shows what’s possible with just two Mini Moogs. When other musicians heard this they must have been left shaking their heads, and wondering how they could come close to replicating this synth masterclass? Little did they know that an even better track Space Probe, hadn’t made the album. Space Probe was an eighteen minute Moog freakout had been recorded in New York or Philadelphia in 1970, and featured pioneering maverick musician Sun Ra at his most inventive and innovative. It’s just a shame that My Brother The Wind Vol. 1 wasn’t released as a double album that included Space Probe? Forty-seven years later, and Cosmic Myth Records recently reissued My Brother The Wind Vol. 1. Space Probe is one of seven bonus tracks on this remastered reissue of My Brother The Wind Vol. 1 which features one of freer performances by Sun Ra and His Astro Infinity Arkestra as they push musical boundaries to their limits and beyond. By 1971, Sun Ra and His Arkestra had signed to Black Lion Records and had just released Pictures Of Infinity, which was reissued by Grey Scale. Pictures Of Infinity wasn’t a new recording, and it’s thought it was recorded around 1967. However, four years passed before the increasingly prolific Sun Ra got round to releasing the album. This meant that critics and record buyers weren’t aware of Sun Ra and His Arkestra’s current sound. Pictures Of Infinity represented their sound four years previously. Despite the time lag between recording and releasing Pictures Of Infinity, critics hailed the album another groundbreaking release that featured a mixture of old favourites and new compositions. 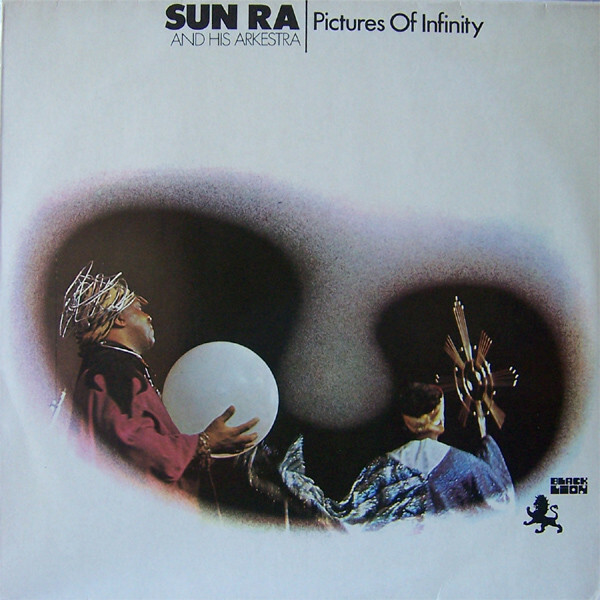 Even the old favourites on Pictures Of Infinity were reinvented during a spellbinding performance where Sun Ra and His Arkestra play with speed, power, and in the case of tenor saxophonist John Gilmore, a flawless fluidity during the melodic Saturn. Always though, the Arkestra display their usual inventiveness as they improvise and take tracks in new and unexpected directions. On Song Of The Sparer the Arkestra’s playing is intricate, before becoming sombre and ruminative during Spontaneous Simplicity. The album closer Spontaneous Simplicity features the Arkestra at the peak of their powers as Sun Ra allows them free rein. Again, their playing is inventive, intricate with the interplay between the flute and Sun Ra’s piano almost flawless, and ensures that this innovative and memorable album of space-age free jazz ends on a high. On Record Store Day 2017, Strut released a lovingly curated reissue of Sun Ra And His Astro Intergalactic Infinity Arkestra’s 1973 album Discipline 27-II. Strut’s reissue of Discipline 27-II was the first official reissue of this classic album from 1973. However, only 1,000 copies of the album were pressed and anyone who wants a copy of Discipline 27-II should buy one sooner, rather than later. 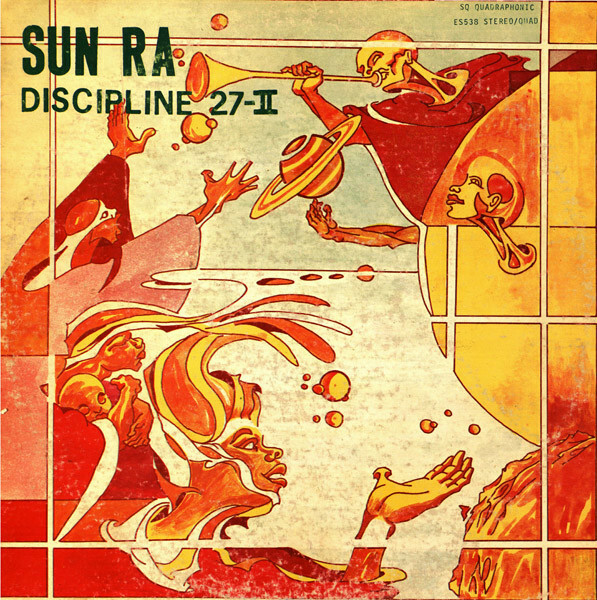 Discipline 27-II was a mixture of music and drama, where Sun Ra And His Astro Intergalactic Infinity Arkestra married elements of avant-garde and free jazz. To do this, Sun Ra’s array of synths and keyboards were augmented by the horns and rhythm sections and a quartet of “space ethnic voices”. They were joined by Sun Ra, who added “vocal dramatizing.” All this was part of an album that was variously melodic, ambitious, innovative and which also swung. Other times, there’s hints of another classic Sun Ra album Space In The Place, which was recorded during a session that lasted one-and-a-half days. During that session, Sun Ra recorded enough music for four albums, including two classic albums Discipline 27-II and Space Is The Place. Sadly, Sun Ra died on May the ’30th’ 1993, aged just seventy-nine. That day, music lost an innovative musician who had played his part in rewriting the history of jazz. Sun Ra is remembered as one of the pioneers of free jazz, and helped shape the genre on over 125 albums. However, even after his death, new albums baring Sun Ra’s music was being released. This included Janus in 1999, which was reissued by ORG Music on yellow vinyl with a black swirl for Record Store Day 2017. Unlike many of the previous albums, Janus doesn’t feature tracks recorded during one session, and instead, features in the studio and live between 1963 and 1970. Island In The Sun, The Invisible Shield and Janus first featured on an album released on Saturn, while the live tracks Velvet and Joy had never been released prior to the release of Janus in 1999. While Janus was released in 1999, it’s thought that Sun Ra had planned to release an album entitled Janus release around 1970 or 1971. However, that never happened, and nothing was heard of the project until six years after Sun Ra’s death. By then, Sun Ra’s popularity was growing, and a new generation of record buyers wanted to hear more of his music. They couldn’t afford an original copies of the albums that Sun Ra released on El Saturn or Saturn Research. This included The Invisible Shield, which was released in 1974 and featured Island In The Sun, The Invisible Shield and Janus. By 1999, copies of The Invisible Shield were incredibly rare and when they changed hands, it was for large sums of money. The only way many fans of Sun Ra’s would hear the trio of tracks on The Invisible Shield was on a reissue like Janus. Eighteen years later, ORG Music reissued Janus, which is on of many albums that have been released after Sun Ra’s death. Some feature tracks that previously featured on existing albums, while others concentrate on live material. 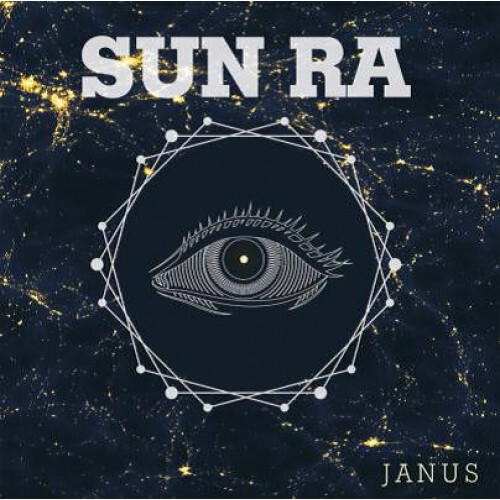 Janus features a mixture of both, and in 1999 and 2017 will be of interest to many fans of Sun Ra, especially completists who want to own everything the great man released during his long and illustrious career. These are just a few of the Sun Ra reissues released during 2017, and are the perfect introduction to newcomers to one of the most innovative free jazz musicians. Sun Ra was also one of the pioneers of free jazz, and took the nascent genre in a new direction. This was the just for Sun Ra, who was a musical chameleon who constantly was striving to reinvent his music. For nearly forty years, Sun Ra pushed musical boundaries to their limits, and sometimes, way beyond. He was a pioneer and innovator, and also a perfectionist and relentless taskmaster. With some of most talented, inventive and adventurous musicians of their generation, Sun Ra set about honing his Arkestra’s sound. He was demanding and exacting standards. Second best was no use to Sun Ra. What he was after was an Arkestra who were innovators and musical adventurers. Sun Ra was never content to stand still musically, and was always looking to reinvent familiar tracks. The original version of a song was merely the starting point. What it became, was anyone’s guess? Sun Ra was forever determined to innovate, and when he reinvented a track, he took the music in the most unexpected direction. He combined Egyptian history and space-age cosmic philosophy with free jazz, avant-garde, improv. Another component of Sun Ra’s music was his unique and inimitable brand of futuristic, space-age jazz which was part of an innovative fusion that totally transformed the career of the man born Herman Poole Blount. Very little is know about the early years of Herman Poole Blount. However, over a long and illustrious career that spanned six decades, Sun Ra fulfilled his potential and became a giant and legend of jazz. This took time, patience and dedication and by his death in 1993, Sun Ra had come a long way since his early days as musician in Birmingham, Alabama. The early days of Sun Ra’s career as a musician in Birmingham, Alabama, helped shape him, and make him the man and musician that he later became. So did his mentor John T. “Fess” Whatley, his religion and the time Herman Poole Blount spent studying at the Black Masonic Lodge, in Birmingham. That was where his love of poetry and interest in Egyptology blossomed. This helped shape the future Sun Ra’s philosophy and music. 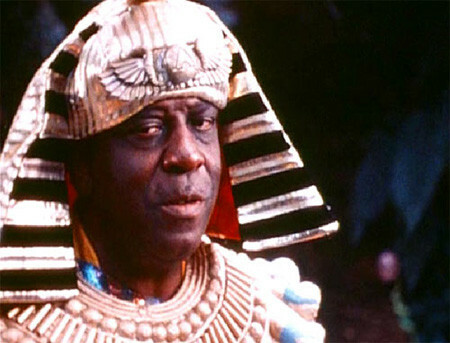 However, it was his ‘trip’ to Saturn that changed his life forevermore and influenced the music he made as Sun Ra. By his death in 1993, Sun Ra had released over 125 albums with a variety of different bands. Many of these albums were reissued during 2017, including six of the seven albums that are featured in this article. They’re a reminder of Mr. Mystery, Sun Ra a musical pioneer who spent six decades creating groundbreaking, innovative and inventive music which in 2017, is more popular than ever.